Try to think back to a time when the internet wasn’t a toxic mix of rage and false equivalence. Trick question! It’s always been. But for a few glorious years in the 1990s, it was also glittery and welcoming and amateurish and wonderful and absurd. 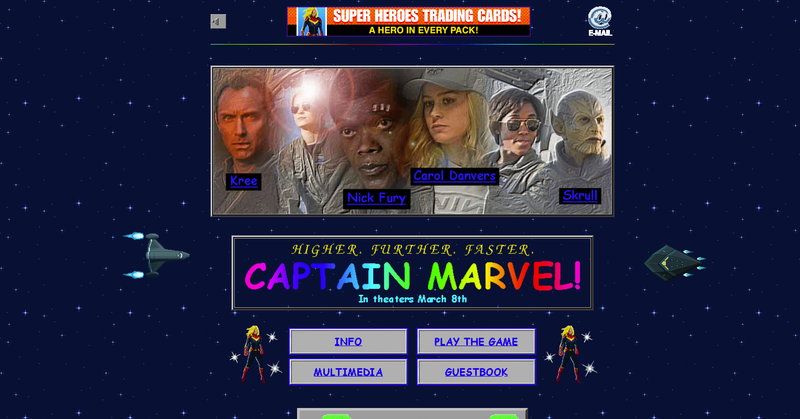 It was the age of Geocities, and an era Marvel has played pitch-perfect homage to with its recently launched Captain Marvel website. The latest cinematic superhero caper comes out on March 8, but it takes place in 1995, a fact that its first trailer seized on perhaps too tightly. (Blockbuster Video! Get it?) But the movie’s promotional site doesn’t just wink at the Matchbox Twenty era. It fully inhabits it. Site counter? Check. HTML frames? Check. A discordant yet earnest mix of font sizes, serifs, and colors? Check them all, friends. Fortunately, you don’t need to take anyone’s word for how closely it hews to sites of that era. Geocities itself disappeared from the internet proper in 2009, but has lived on thanks to archival efforts. There’s even a search engine for old sites, although many of them are now broken in various ways. Or better yet, look to the shockingly well-preserved site for another movie, Space Jam, an internet time capsule that has famously defied the cruelties of time. Even the way Marvel built the site appears to have been at least approximately true to the era. The company declined to make the team available for interviews, but Marvel Entertainment director of software engineering Lori Lomberg shared on Twitter that they built it using FrontPage, an HTML editor from the late ’90s into the early aughts, and hosted it on Angelfire, a service that launched in 1996 and, surprise, still exists. The Captain Marvel site does take some liberties. It weighs in at 382 kilobytes—well over 100 times greater than the Space Jam homepage, and a bear to download given the cutting edge of modem technology at the time. (In fairness, it’s still tiny next to, say, WIRED.com, which sat at 4.7 megabytes in a recent spot check.) The counter doesn’t actually count. The guest book doesn’t actually take sign-ins. And the assets the site houses—the promotional stills, the trailer—retain all their 21st century sheen. That may be felt even more acutely on the internet, especially given that for most people, 1995 represents a sort of pre-history. Only 14 percent of the US went online from work, school, or home that year, according to a contemporaneous Pew Research study. Which underscores another major difference between sites like Captain Marvel and the Space Jam pioneers: People will actually see the former. Meanwhile, the Captain Marvel site has notched over 100,000 engagements on Facebook in just a few days, according to data from analytics company Buzzsumo. It’s the kind of reach Geocities could never have imagined in its heyday, that mythical simpler time, before Facebook existed at all.